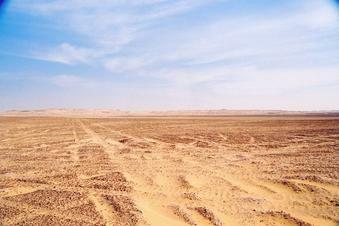 28-Nov-2003 -- Traveling east over 2 km from the Kharga Oasis - Asyūṭ highway to this location is very bumpy. You are required to proceed perpendicular to hundreds, perhaps thousands of tank tracks that crisscross the desert. The tracks run between two small army bases that sandwich the DC one to the north and one to the south. We found this DC to be particularly uninteresting. #5: The DC is located on the side of this mound of sand and dirt.